Spotify has now gone mobile - will Windows Mobile be next? Spotify has released its long-awaited apps for iPhone and Android. has previously been available on Android. "We've worked hard to bring you the same great Spotify experience you're already familiar with to your phone," said Spotify spokesman Andres Sehr in a blog post. 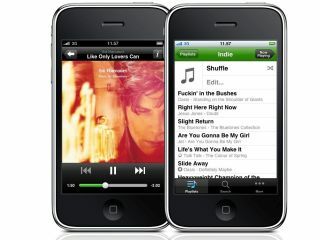 "The mobile apps will allow you to take the entire Spotify catalogue and put it in your pocket. You can use our 'offline mode' to make playlists available at all times, even when no connection is available, perfect for that ride on the tube or long flight across the Atlantic." Offline tracks are available for up to 30 days by which time you need to have gone back online. As expected, Spotify says you'll need a Premium account (£9.99 per month) to use the service, but the app itself is free. And Sehr also hinted at more development in the mobile arena. "Launching these apps is our first step at going mobile and we'd like to thank all the people who worked hard on making this happen as well as all the partners involved in the process," he added.